Left to Right: Drew Goddard '17, Riley Goddard '19, Cole McNally '20, Patrick Fayad '19, James Crotty '19, Andrew Nigro '18. 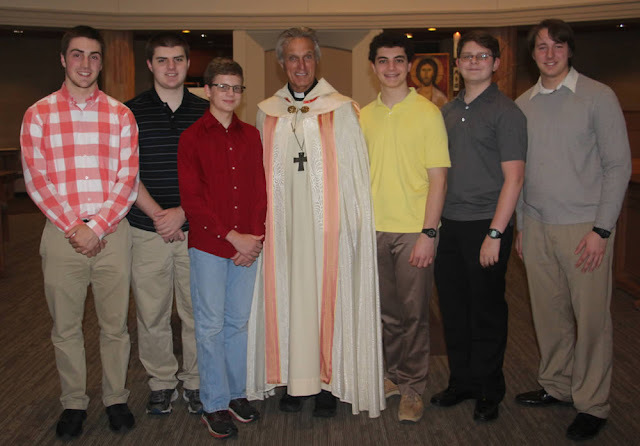 This past school year a student oblate program was begun at the Mount. Meetings were held on a regular basis instructing candidates in the way of Saint Benedict. At Sunday vespers 6 students professed their oblation. As Oblates these young men dedicate themselves in a special way to live as balanced Christian people, offering witness to the world of Christ's transformative power. What sets them apart from other devoted Christian people is their special way of living out an enriched Christian life, according to the Gospel as reflected in the Rule of St. Benedict.